|text= Because me and my brother -- my Lucifer -- when we fought in my world, we thought that God would come back, give us answers -- why He'd gone, what we'd done -- but, instead, do you know what happened? Nothing. No God. Nothing. And now now that I'm in here -- now I know why. God -- Chuck -- is a writer, and like all writers, He churns out draft after draft. My world? This world? Nothing but failed drafts. And when He realizes that they're flawed, He moves on and tries again. With the [[Apocalypse]] having gone forward, Michael emerged as victor, having killed Lucifer at some point in the past over Abilene, Kansas. Having conquered the Earth, Michael has not brought paradise to the world, but continued to fight various battles and wars against humans and demons, ravaging the planet and turning it into [[Apocalypse World|a post-Apocalyptic wasteland]]. With the [[Apocalypse]] having gone forward, Michael emerged as victor, having killed Lucifer at some point in the past over Abilene. Having conquered the Earth, Michael did not bring paradise to the world, but continued to fight various battles and wars against humans and demons, ravaging the planet and turning it into [[Apocalypse World|a post-Apocalyptic wasteland]] after God failed to return after Lucifer's defeat. Once Michael took over [[Dean Winchester]] as his [[vessel]], he stated his intent to "do it right" in this new world. Due to his ability to tap into Dean's memories, Michael came to the belief that [[God]] / [[Chuck]] moves from one universe to another when He realizes each is flawed, causing Michael to change his plans from trying to bring paradise to the world to burning it down and moving on to other universes to do the same until he caught up with his Father. Possessing an unknown man, Michael typically appears in a dark trench coat. [[Lucifer]] calls him stronger than the [[Michael]] of the main universe and he easily defeats Lucifer in a fight. In this vessel, Michael is not at full strength as he is not Michael's true vessel. In the body of [[Dean]], Michael is stated to be stronger than he has ever been. Possessing an unknown man in [[Apocalypse World]], Michael would appear in a dark trench coat. [[Lucifer]] called him stronger than the [[Michael]] of the main universe and he easily defeated Lucifer in a fight. After his vessel was damaged by [[Jack]]'s power, Michael declared himself unable to beat Lucifer again. In the body of [[Dean]], Michael was stated to be stronger than he had ever been. 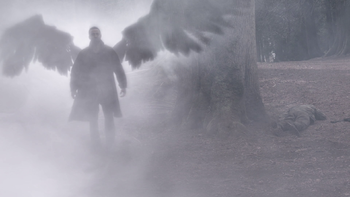 After gaining consent, Michael initially lent Dean access to several of his powers to fight Lucifer, particularly his teleportation, strength, and flight capabilities. 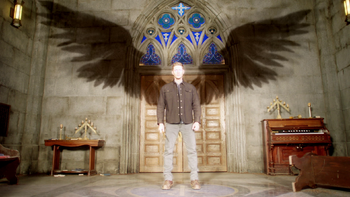 After Lucifer's death Michael took full control of Dean's body and disappeared into the world. Michael also changed Dean's attire from plaid to a 1920s-style suit and cap. Due to leaving the door open a crack in Dean's mind when he left, Michael possessed the ability to see through Dean's eyes even when he was not in his body, resulting in dizzy spells for Dean. Even while locked away inside of Dean's mind and cut off from all contact with his monsters, Michael appeared to be aware of what was going on in the world around him as he knew about Dean's plan with the [[Ma'lak Box]] without being told. * [[Clairsentience]] - He could sense that Lucifer was from another world. * Celestial energy - Michael was able to channel his power into balls of energy when attacking enemies. * [[Clairsentience]] - He could sense that Lucifer was from another world, as well as the different energy flowing from [[Dark Kaia]] and her [[Kaia's Spear|spear]]. * [[Mind hacking]] - Michael was able to "hitch a ride" on [[Lucifer]]'s temporal lobe, allowing him to see his universe as well as compel Lucifer to talk about it and it's creation. * Flight - Unlike previous angels, Michael showed the ability of flight and levitation. * [[Mind control]] - Michael had the ability to control his [[Michael's Monsters|enhanced monsters]], compelling them to commit acts of violence, even against their wills. * Super strength - He has strength above that of [[Lucifer]]. * [[Mind hacking]] - Michael was able to "hitch a ride" on [[Lucifer]]'s temporal lobe, allowing him to see his universe as well as compel Lucifer to talk about it and its creation. * [[Telepathy|Mind reading]] - While trying to find what the beings of Earth want, Michael reads the mind of a Muslim man, Jamil Hamed. * Super strength - Michael had strength above that of [[Lucifer]], claiming to have ripped his Lucifer to pieces above Abilene, Kansas. During a fight with Lucifer (who was at full power) when he first arrived in Apocalypse World, Michael easily defeated him and nearly broke Lucifer's arm. 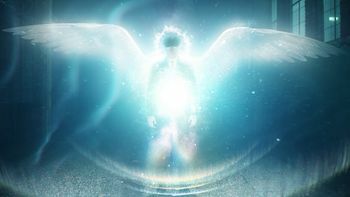 * [[Teleportation]] - Coming from [[Apocalypse World]], Michael was the only angel in our world still capable of teleporting due to his [[Angel Wings|wings]] being intact. * [[Telekinesis]] - Michael could move objects and people with thoughts alone. ** Biokinesis - Michael could remove the air from lungs, blind, and cause physical pain in others with a gesture. However, he appeared to require concentration to maintain this, as when Jack blasted Michael off his feet these effects ended. * [[Angel cuffs]] - After [[Bobby Singer (Apocalypse World)|Bobby]] was able to modify the spellwork on a pair of specially-etched cuffs, they negated Michael's powers. * [[Archangel blade]] - In the hands of another archangel, the blade was capable of killing Michael. * [[Holy fire]] - While unable to kill Michael, holy fire had been shown to be effective against him. A line of holy fire held Michael back for a time with Michael appearing to not be able to cross it. A holy fire Molotov cocktail caused Michael immense pain and distracted him long enough to be handcuffed. However, Michael was quickly able to put out the fire and was otherwise unharmed. * [[Kaia's Spear]] - The energy radiating from [[Dark Kaia]]'s spear was powerful enough to injure Michael, and permanently scar his former vessel, Dean. * [[Ma'lak Box]] - A warded coffin that can contain angels, including an [[archangel]] as powerful as Michael. According to a book from [[Death's Reading Room]], the box was the only way to stop Michael from escaping and using Dean's body to destroy the world. * [[Nephilim]] - The full force of Jack's powers on Michael was able to "break" and severely weaken Michael and his first vessel. When Jack tapped into the power of his [[soul]], he was able to force Michael out of [[Rowena]] (whom he had taken as a vessel) and burns Michael's essence away, leaving only his grace which Jack consumed. * Strong-willed [[vessel]]s - Michael's true vessel, Dean Winchester, was able to lock Michael away within his own mind and keep him contained there for months until Dean was knocked [[unconscious]]. Stuck together, Lucifer makes a deal with Michael to show him how the Winchesters performed the [[spell]] to open the rift. In exchange, Lucifer will get his son, and Michael will get everything else. After Sam and Dean talk Jack down from killing an innocent gas station employee, Jack storms out of the store and the ground begins to shake followed by a high pitched piercing noise, signaling the arrival of an angel. Suddenly, Michael appears before [[Sam]], [[Dean]], and Castiel, forcing them to flee. As they reach the outside, Michael blows out the windows of the gas station convenience store, taunting Castiel to attack him. Unbeknownst to Michael, though, Dean has grabbed a container of [[holy oil]] from the trunk of the [[Impala]] and created a Molotov, which he throws it at Michael, creating a barrier between them and allowing them to escape. Having been disappointed by his conversations with humans, demons, and angels alike, Michael stands before a young man telling him he is worth saving because his wants are simple and pure -- wanting only to eat. He tells him that they are going to work well together as the young man's vampire fangs descend. In an abandoned church, Michael drains blood from the throat of a vampire into a chalice, then mixes a little bit of his [[grace]] with the vampiric blood and forces the vampire to drink it, causing the man to burn out from the inside. Disappointed at his failure, he drags the man's body and lays it on top of a pile of corpses before turning his attention to three other vampires chained up asking, "who's next?" In a hotel room Michael is dressing himself in a tuxedo. While looking in a mirror, Dean takes over the reflection and attempts to eject Michael from his body, which does not work due to how powerful Michael is. Michael later returns to his hotel room with a woman, Melanie. As they flirt, Melanie quickly reveals she is a werewolf, but Michael is able to subdue her, revealing he knew what she was and chose her for a reason, then he tells her to call her "master." In the morning, Michael sits down with Philippe over drinks, and makes a proposal. Admiring the simplicity of the werewolves' wants, Michael offers to enhance their "talents" to help remove humans from the top of the food chain. While Philippe believes Michael's plan is the world he wants to live in, he calls it an absurd dream. Michael counters by offering to turn his pack from the hunted into the hunter. After being spared her life, [[Lydia Crawford]] is packing a bag when Michael appears in her kitchen. He tells Lydia that he let her escape from him to be bait for the hunters. With his trap now sprung, he no longer needs his "bait," and he goes on to [[smite]] Lydia. [[Dark Kaia]] describes her encounter with Michael to Sam, Dean, and Jody. She relates how he appeared to her in the woods, telling her that he sensed her energy and the energy coming from her [[Kaia's Spear|spear]]. Michael makes her an offer: she can join his ranks and give him her spear, or she can fight and probably die while he just takes the spear. Kaia chooses to attack Michael, who easily blocks each strike Kaia makes until she is able to catch him by surprise with a leg sweep. 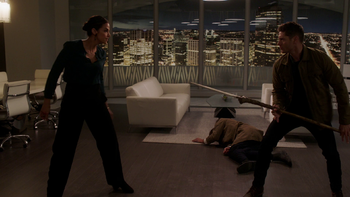 With Michael on the ground, Kaia takes her spear and pierces him in the arm, causing great pain to the archangel, scarring him and Dean. 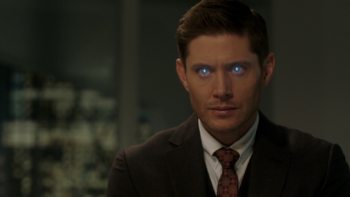 The [[djinn]] [[Neil (Djinn)|Neil]] reveals to Dean that Michael has made deals with monsters -- in return for his "upgrades," they are to find somewhere quiet, set up shop, and kill as many hunters as possible. He also tells Dean that Michael has made dozens of enhanced monsters who have set up traps to kill hunters. Michael, in a new female vessel, has some of his monsters clear out the Hitomi Plaza office building in Kansas City, Missouri, to serve as the base of operations for his upcoming plan to turn everyone in the city into a monster for his army. He meets with two new volunteers to take his enhancement: two werewolves, one of whom he recognizes as a friend of the Winchesters, [[Garth]]. Garth assures Michael that with his family to worry about, all he cares about is protecting them. Once Michael witnesses Garth consuming the blood and grace mixture, Michael turns his attention to [[Melanie]], and after learning of Dark Kaia's location, orders her to send out troops to destroy the Spear. After learning of Jack and Sam's location, Michael and some of his troops ambush the two. As Jack is dragged away, Michael confronts Sam while holding the Hyperbolic Pulse Generator, easily melting it in his hands in front of Sam before knocking him out. Back at Hitomi Plaza, Michael explains to Jack that in his weakened state he isn't worth killing, and that when his power finally returns to him he will be the only other being that can come close to understanding him and his power, and that eventually it will all fade away from him too. After Jack's escape, Michael waits in his office as night falls, until he begins sensing Castiel's presence. He quickly finds Castiel in the hallways, and proceeds to beat him to a bloody pulp. He drags his limp body back into his office, where Sam and Jack lay in wait. Michael, sensing their presence, stops them from attacking, causing them debilitating pain and forcing them to the ground. With the Spear in hand Dean attacks Michael, who dodges his strikes and knocks Dean to the ground. As Michael is about to show Dean his mistake, Sam slides the spear to him, allowing Dean to cut Michael's arm. As Dean advances on Michael, he comes to a sudden stop, unable to strike Michael down. As Michael continues staring at Dean, Dean's vision becomes blurry and he begins seeing visions of his time as Michael before Michael's female vessel collapses to the floor. Dean snaps the Spear in two, revealing himself as possessed by Michael once more. Michael explains how he needed to break Dean, in order to keep him suppressed for good in his mind. He tells them that Dean is "gone" and his army ready for his command as he snaps his fingers. After snapping his fingers, Michael changes to his traditional wardrobe, and forces everyone to the ground as his monster army begins turning the people of Kansas City. Sam is able to throw a Molotov of [[holy oil]] at Michael, distracting him long enough for Castiel to place the [[angel cuffs]] on him, rendering him powerless as his monsters attempt to break down the door. With the help of the [[reaper]] [[Violet]], the group is teleported back to the Bunker where Michael is restrained as Sam formulates a plan to get Dean to eject Michael. While waiting in the Bunker, Michael plays mind games with Jack, telling him how Dean was relieved that he died and was no longer a burden. He then speaks with Castiel, and when asked why he wants to burn the Earth, Michael puts forth his theory that [[God]] moves on from universe to universe when He finds them flawed, due to His never returning when Michael killed his Lucifer. Sam hooks Michael to the machine the [[British Men of Letters]] used to brainwash Mary which had allowed Dean access into her mind. Connecting to Michael, Sam and Castiel enter Dean's mind, where Sam realizes that for Michael to keep Dean quiet, he would hide him in a good memory rather than a traumatic one. They soon find Dean in [[Rocky's Bar]]. When Sam is able to snap Dean out of his dreamworld, Michael arrives in the bar. Realizing he is powerless in Dean's mind, Sam, Dean, and Castiel attempt to fight him, but are no match. Michael points out that if Dean ejects him from his body, Dean will be left as nothing but blood and bones. Instead, Dean decides to trap Michael, shoving him into a storage room and locking the door, making himself "the Cage" and trapping Michael within his own subconscious. Furious, Michael screams and continually attempts to break the door down, to no avail. As Michael continues to try to escape, Dean is visited by [[Billie]], who can sense Michael's efforts. Billie tells Dean that all versions but one of Dean's fate have now changed to Michael escaping from his prison and using Dean's body to destroy the world. Billie supplies Dean with the book from [[Death's Reading Room]] revealing what must be done to stop Michael, shocking Dean with what it says. Michael continues to scream and pound on the storeroom door in an attempt to escape, causing Dean to have a brief episode. Later Dean tells Sam that he can feel the door giving way, and that Michael will eventually escape. Michael continues to try and break free from the storeroom in Dean's mind, which Dean is able to once again shake off. Michael continues to try to break free from Dean's mind, with Dean telling [[Castiel]] that it's taking all of his concentration to keep Michael contained. As a result, Dean is barely even sleeping anymore. After Dean is knocked [[unconscious]] by the [[gorgon]] [[Noah Ophis]], he loses concentration and Michael is able to escape his mind. However, rather than take control of Dean again, Michael abandons his body and visits [[Rowena]]'s mind in Dean's form, seeking her as an alternate [[vessel]]. Michael is able to get Rowena's consent by threatening to come back in a different vessel and force her to watch him slaughter everyone in the Bunker that Rowena cares about. 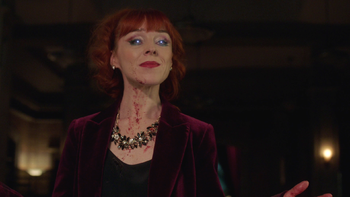 In Rowena's body, Michael slaughters several hunters and smites [[Maggie (Apocalypse World)|Maggie]] before gloating to the Winchesters, Castiel, and Jack. As Michael inflicts multiple ailments upon them, [[Jack Kline|Jack]] taps into the power of his [[soul]] and battles with Michael, who taunts Jack. Jack is able to withstand Michael's attacks and [[exorcism|exorcises]] Michael from Rowena. As Michael swirls above everyone in a cloud of white light, Jack raises his arms and burns the [[archangel]] away before consuming his [[grace]]. 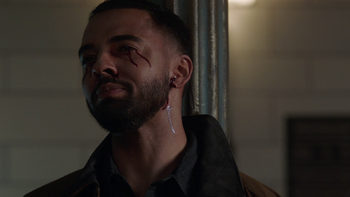 Jack announces that Michael is dead and reveals that Michael's grace has fully restored Jack's own powers as a [[Nephilim]], lost when Lucifer stole Jack's grace months before. Because me and my brother -- my Lucifer -- when we fought in my world, we thought that God would come back, give us answers -- why He'd gone, what we'd done -- but, instead, do you know what happened? Nothing. No God. Nothing. And now now that I'm in here -- now I know why. God -- Chuck -- is a writer, and like all writers, He churns out draft after draft. My world? This world? Nothing but failed drafts. And when He realizes that they're flawed, He moves on and tries again. With the Apocalypse having gone forward, Michael emerged as victor, having killed Lucifer at some point in the past over Abilene. Having conquered the Earth, Michael did not bring paradise to the world, but continued to fight various battles and wars against humans and demons, ravaging the planet and turning it into a post-Apocalyptic wasteland after God failed to return after Lucifer's defeat. Once Michael took over Dean Winchester as his vessel, he stated his intent to "do it right" in this new world. Due to his ability to tap into Dean's memories, Michael came to the belief that God / Chuck moves from one universe to another when He realizes each is flawed, causing Michael to change his plans from trying to bring paradise to the world to burning it down and moving on to other universes to do the same until he caught up with his Father. Possessing an unknown man in Apocalypse World, Michael would appear in a dark trench coat. Lucifer called him stronger than the Michael of the main universe and he easily defeated Lucifer in a fight. After his vessel was damaged by Jack's power, Michael declared himself unable to beat Lucifer again. In the body of Dean, Michael was stated to be stronger than he had ever been. Due to leaving the door open a crack in Dean's mind when he left, Michael possessed the ability to see through Dean's eyes even when he was not in his body, resulting in dizzy spells for Dean. Even while locked away inside of Dean's mind and cut off from all contact with his monsters, Michael appeared to be aware of what was going on in the world around him as he knew about Dean's plan with the Ma'lak Box without being told. Celestial energy - Michael was able to channel his power into balls of energy when attacking enemies. Clairsentience - He could sense that Lucifer was from another world, as well as the different energy flowing from Dark Kaia and her spear. Flight - Unlike previous angels, Michael showed the ability of flight and levitation. Mind control - Michael had the ability to control his enhanced monsters, compelling them to commit acts of violence, even against their wills. Mind hacking - Michael was able to "hitch a ride" on Lucifer's temporal lobe, allowing him to see his universe as well as compel Lucifer to talk about it and its creation. Mind reading - While trying to find what the beings of Earth want, Michael reads the mind of a Muslim man, Jamil Hamed. Super strength - Michael had strength above that of Lucifer, claiming to have ripped his Lucifer to pieces above Abilene, Kansas. During a fight with Lucifer (who was at full power) when he first arrived in Apocalypse World, Michael easily defeated him and nearly broke Lucifer's arm. Teleportation - Coming from Apocalypse World, Michael was the only angel in our world still capable of teleporting due to his wings being intact. Telekinesis - Michael could move objects and people with thoughts alone. Biokinesis - Michael could remove the air from lungs, blind, and cause physical pain in others with a gesture. However, he appeared to require concentration to maintain this, as when Jack blasted Michael off his feet these effects ended. Angel cuffs - After Bobby was able to modify the spellwork on a pair of specially-etched cuffs, they negated Michael's powers. Archangel blade - In the hands of another archangel, the blade was capable of killing Michael. Holy fire - While unable to kill Michael, holy fire had been shown to be effective against him. A line of holy fire held Michael back for a time with Michael appearing to not be able to cross it. A holy fire Molotov cocktail caused Michael immense pain and distracted him long enough to be handcuffed. However, Michael was quickly able to put out the fire and was otherwise unharmed. 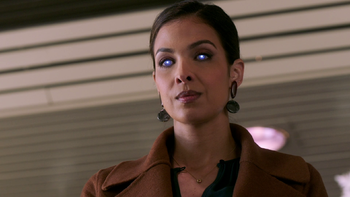 Kaia's Spear - The energy radiating from Dark Kaia's spear was powerful enough to injure Michael, and permanently scar his former vessel, Dean. Ma'lak Box - A warded coffin that can contain angels, including an archangel as powerful as Michael. According to a book from Death's Reading Room, the box was the only way to stop Michael from escaping and using Dean's body to destroy the world. Nephilim - The full force of Jack's powers on Michael was able to "break" and severely weaken Michael and his first vessel. When Jack tapped into the power of his soul, he was able to force Michael out of Rowena (whom he had taken as a vessel) and burns Michael's essence away, leaving only his grace which Jack consumed. Strong-willed vessels - Michael's true vessel, Dean Winchester, was able to lock Michael away within his own mind and keep him contained there for months until Dean was knocked unconscious. In an abandoned church, Michael drains blood from the throat of a vampire into a chalice, then mixes a little bit of his grace with the vampiric blood and forces the vampire to drink it, causing the man to burn out from the inside. Disappointed at his failure, he drags the man's body and lays it on top of a pile of corpses before turning his attention to three other vampires chained up asking, "who's next?" After being spared her life, Lydia Crawford is packing a bag when Michael appears in her kitchen. He tells Lydia that he let her escape from him to be bait for the hunters. With his trap now sprung, he no longer needs his "bait," and he goes on to smite Lydia. Michael is scarred by Dark Kaia's spear. Dark Kaia describes her encounter with Michael to Sam, Dean, and Jody. She relates how he appeared to her in the woods, telling her that he sensed her energy and the energy coming from her spear. Michael makes her an offer: she can join his ranks and give him her spear, or she can fight and probably die while he just takes the spear. Kaia chooses to attack Michael, who easily blocks each strike Kaia makes until she is able to catch him by surprise with a leg sweep. With Michael on the ground, Kaia takes her spear and pierces him in the arm, causing great pain to the archangel, scarring him and Dean. The djinn Neil reveals to Dean that Michael has made deals with monsters -- in return for his "upgrades," they are to find somewhere quiet, set up shop, and kill as many hunters as possible. He also tells Dean that Michael has made dozens of enhanced monsters who have set up traps to kill hunters. Michael, in a new female vessel, has some of his monsters clear out the Hitomi Plaza office building in Kansas City, Missouri, to serve as the base of operations for his upcoming plan to turn everyone in the city into a monster for his army. He meets with two new volunteers to take his enhancement: two werewolves, one of whom he recognizes as a friend of the Winchesters, Garth. Garth assures Michael that with his family to worry about, all he cares about is protecting them. Once Michael witnesses Garth consuming the blood and grace mixture, Michael turns his attention to Melanie, and after learning of Dark Kaia's location, orders her to send out troops to destroy the Spear. After learning of Jack and Sam's location, Michael and some of his troops ambush the two. 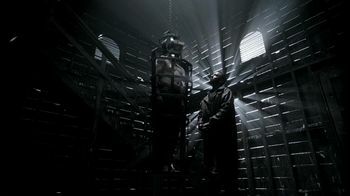 As Jack is dragged away, Michael confronts Sam while holding the Hyperbolic Pulse Generator, easily melting it in his hands in front of Sam before knocking him out. Dean faces off against Michael. After snapping his fingers, Michael changes to his traditional wardrobe, and forces everyone to the ground as his monster army begins turning the people of Kansas City. 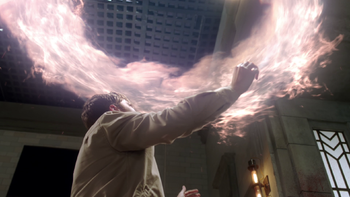 Sam is able to throw a Molotov of holy oil at Michael, distracting him long enough for Castiel to place the angel cuffs on him, rendering him powerless as his monsters attempt to break down the door. With the help of the reaper Violet, the group is teleported back to the Bunker where Michael is restrained as Sam formulates a plan to get Dean to eject Michael. While waiting in the Bunker, Michael plays mind games with Jack, telling him how Dean was relieved that he died and was no longer a burden. He then speaks with Castiel, and when asked why he wants to burn the Earth, Michael puts forth his theory that God moves on from universe to universe when He finds them flawed, due to His never returning when Michael killed his Lucifer. Sam hooks Michael to the machine the British Men of Letters used to brainwash Mary which had allowed Dean access into her mind. Connecting to Michael, Sam and Castiel enter Dean's mind, where Sam realizes that for Michael to keep Dean quiet, he would hide him in a good memory rather than a traumatic one. They soon find Dean in Rocky's Bar. When Sam is able to snap Dean out of his dreamworld, Michael arrives in the bar. Realizing he is powerless in Dean's mind, Sam, Dean, and Castiel attempt to fight him, but are no match. Michael points out that if Dean ejects him from his body, Dean will be left as nothing but blood and bones. Instead, Dean decides to trap Michael, shoving him into a storage room and locking the door, making himself "the Cage" and trapping Michael within his own subconscious. Furious, Michael screams and continually attempts to break the door down, to no avail. As Michael continues to try to escape, Dean is visited by Billie, who can sense Michael's efforts. Billie tells Dean that all versions but one of Dean's fate have now changed to Michael escaping from his prison and using Dean's body to destroy the world. Billie supplies Dean with the book from Death's Reading Room revealing what must be done to stop Michael, shocking Dean with what it says. Jack burns Michael away, leaving only his grace behind. Michael continues to try to break free from Dean's mind, with Dean telling Castiel that it's taking all of his concentration to keep Michael contained. As a result, Dean is barely even sleeping anymore. After Dean is knocked unconscious by the gorgon Noah Ophis, he loses concentration and Michael is able to escape his mind. 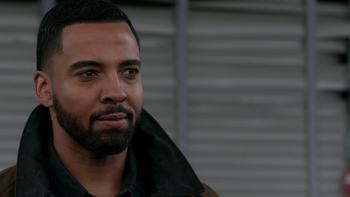 However, rather than take control of Dean again, Michael abandons his body and visits Rowena's mind in Dean's form, seeking her as an alternate vessel. Michael is able to get Rowena's consent by threatening to come back in a different vessel and force her to watch him slaughter everyone in the Bunker that Rowena cares about. In Rowena's body, Michael slaughters several hunters and smites Maggie before gloating to the Winchesters, Castiel, and Jack. As Michael inflicts multiple ailments upon them, Jack taps into the power of his soul and battles with Michael, who taunts Jack. Jack is able to withstand Michael's attacks and exorcises Michael from Rowena. As Michael swirls above everyone in a cloud of white light, Jack raises his arms and burns the archangel away before consuming his grace. Jack announces that Michael is dead and reveals that Michael's grace has fully restored Jack's own powers as a Nephilim, lost when Lucifer stole Jack's grace months before.